Preheat oven to 375°F. In a saucepan, cover cubed potatoes with water. Cover pan and bring potatoes to a boil, cooking until just tender; drain. Place cod fillets in the bottom of a small, lightly greased casserole dish. Sprinkle cod with minced garlic, 1/4 teaspoon black pepper, and 3/4 of the fresh dill (reserve the remaining dill for later). 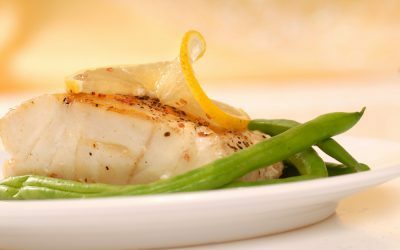 Bake in oven for 10–15 minutes, until cod fillets are just tender. Meanwhile, mash cooked, cubed potatoes with 1/2 cup milk, 1 tablespoon margarine spread, and the remaining 1/4 teaspoon black pepper until smooth and creamy. Prepare lemon white sauce by melting 1 tablespoon margarine spread in a saucepan and stirring in 1/8 teaspoon pepper and lemon juice. Whisk flour into 1 cup milk, add it to saucepan, and cook over medium heat, stirring until sauce is well blended and thickened. When cod fillets are tender, remove casserole dish from oven and cover entire surface of fish with mashed potatoes. With a spoon, make a shallow indentation running vertically along the mashed potatoes, creating a channel for the lemon white sauce. Fill channel with sauce until it slightly overflows into the mashed potatoes. Sprinkle casserole with remaining fresh dill and return it to the oven for an additional 15 minutes, or until mashed potatoes are slightly golden on top. Serving size: 1 cod fillet, 1/2 cup mashed potatoes, 1/4 cup lemon white sauce. Exchanges per serving: 1 1/2 starch, 1 1/2 lean meat.